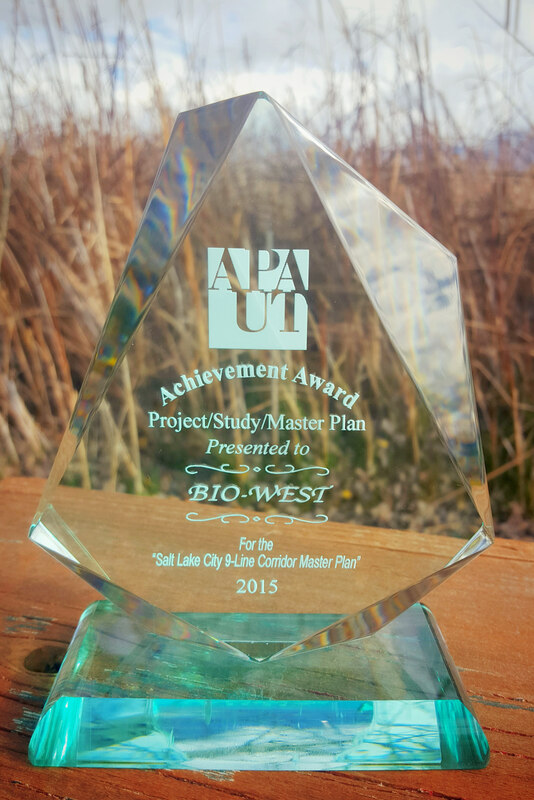 A project vision, phasing, and implementation plan for a former Salt Lake City rail line received an achievement award from the American Planning Association-Utah Chapter in late October 2015. CRSA’s project team, which included BIO-WEST, developed a Master Plan for the 2.5-mile 9 Line Corridor that runs along 900 South Street between 200 West Street and the Surplus Canal. The corridor provides pedestrian and bicycle connections to the downtown and canal areas and is envisioned as a community space for parks, art, and shops, while functionally connecting two sides of the city and their respective neighborhoods, recreational opportunities, and schools. The master plan involved developing strategies and action items that address issues such as the 9 Line Trail, the Jordan River Parkway, the Interstate-15 Gateway, pedestrian and bicycle safety, recreation and open space planning, and the integration of a variety of other transportation forms. The design team’s project services included public engagement, urban planning, economic development, streetscape design, corridor identity, environmental restoration, and document publication. Click here to see the 9 Line Corridor Master Plan.